Tuesday night was one of the most exciting of all time at Laurel South – it was our First Moosebowl!!! This exciting football game between the Rattlesnakes and the Black Bears of Rangeley became far more than just a game…it was an event to match the Super Bowl! While the two teams battled it out on the field, we had tailgating, tee shirt slingshots, dancing, singing, half time contests and more. In the end, the Black Bears prevailed, but all of the men of Rangeley felt victorious in knowing they were the pioneers of a game which will only grow in stature for years to come!!! We also hosted the first ever Laurel South Invitational 5-K, as friends from many camps arrived to race the quickest Laurel South has to offer. We all enjoyed ourselves and raced admirably. Thursday we headed to Funtown for our final incredible “S” Day of the Session. We are down to our final “A” Day and “B” Day of the season and busy preparing for the Dance and Gymnastic Show. Where did the time go? This entry was posted in Uncategorized on August 11, 2011 by Camp Laurel South. What an unbelievable “S” Day we had. We started off with an incredible breakfast followed by an awesome movie morning. After Rest Hour, we were amazed by the level of talent of our campers in the Camper Variety Show and we topped off the day the incredible Laurel South Carnival!!! Tomorrow night is our First Annual Moosebowl Game, pitting the Rattlesnakes against the Black Bears in Rangeley Flag Football Game. The entire camp will be on hand to witness the game, enjoy the entertainment of the Laurel South Dancers, have a great Tailgate Party and spend time with friends. We may only have one week left, but there is plenty of excitement to be had!!! This entry was posted in Uncategorized on August 9, 2011 by Camp Laurel South. Summer is winding down. Wait – we just got here! That’s how fast camp goes. One day a kid boards the bus with nervous anticipation. The next, he heads home on the same bus with a smile and a lifetime of memories. They don’t even realize that – in addition to having tons of fun – they’ve grown a lot. Counselors are cool. We talked about everything. Before I went to camp, people said the food stinks. It didn’t. I learned I could swim a lot farther than I thought. But the waterfront guys told me I could do it all along. It’s impossible for my counselor to pack everything back up the way my mom did before camp. It’s okay to wake up early if you don’t know what time it is. I’m not sure, but I may ask my parents if I can do yoga when I get home. Sometimes when people say “hurry up, you’ll be late,” they really mean it. Sometimes they don’t. I always thought I liked lacrosse better than soccer. Now I’m not sure. I saw my sister less this summer than I do at home. But it was still nice having her here. No one will clean up your cabin for you, except you. It’s really nice if your parents write a lot, even if they don’t say much in their letters. It’s hard to canoe when your paddle falls in the water. I have eight new best friends. When they tell you to bring a sweatshirt and a blanket, they know what they are talking about. I was positive I couldn’t live without my cell phone. Now I forget where I put it in my room before I left. How come no one ever told me that waterskiing was so much fun? It’s good to go on trips away from camp. And it’s good to come back. I like my new nickname a lot. When I came to camp I missed my dog. When I go home I’m going to miss my horse. Maine is an awesome state! It feels like I grew five inches, but the nurse says only one. I still can’t sing, but our play was amazing anyway. 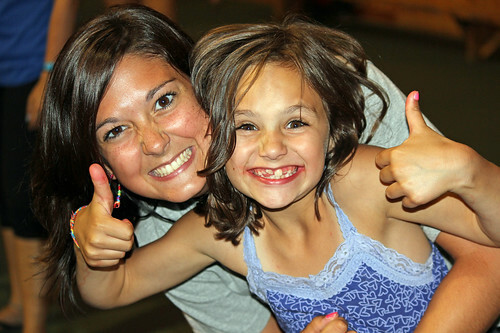 My goal in life is to come back as a counselor. This entry was posted in Uncategorized on August 7, 2011 by Camp Laurel South. 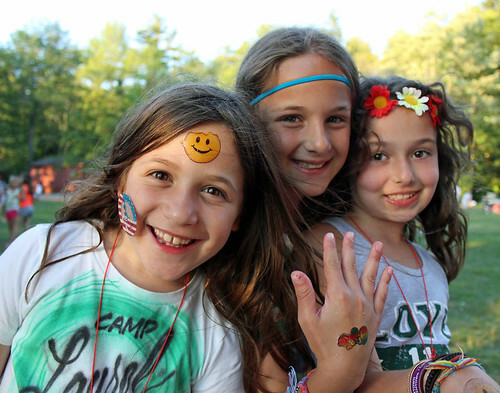 The action never stops at Camp Laurel South! This morning our 8th Graders departed for their all new, exciting trip to North Conway, NH. They will ride a train to the top of the mountain for lunch and hiking, spend the afternoon at Kahuna Laguna Indoor Water Park, eat a delicious dinner at a local restaurant featuring farm-raised, organic ingredients, and spend tomorrow sightseeing in beautiful North Conway. Our 6th Grade girls left for their overnight camping trip as well. Both trips will return on Friday, just in time for our Saturday “S” Day with Carnival Afternoon. 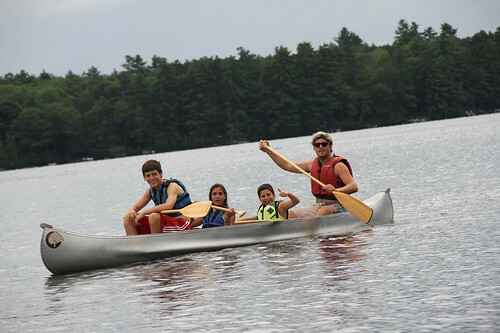 Intercamp games and tournaments are in full swing, and there is never a dull moment on the shores of Crescent Lake!!! This entry was posted in Uncategorized on August 5, 2011 by Camp Laurel South. It appeared to be any other casual lunch on Friday afternoon. As we were eating, little by little strange things started happening. All of a sudden, the water turned Green and Blue. Out of nowhere a Pirate and a Ninja began dueling in the Dining Hall and out on the lawn. Suddenly, a roar was heard from all over camp: It was our CIT’s breaking 2011 Spirit Days!!! For the next day and a half, the Green Ninjas and Blue Pirates battled it out in friendly competition. From CIT CHAOS, to the Moosehead Relay, the Tug of Ohana to the Closing Ceremonies with Songs and Cheers, an amazing time was had by all. In the end, as the campers’ put so well in their cheers, “Blue and Green were one big team!” Today, the entire camp is off to Canobie Lake for a great S-Day. We are psyched!! This entry was posted in Uncategorized on August 2, 2011 by Camp Laurel South.